As I teenager I could not wait to get away from small town rural ranch life and experience what the world had to offer. I had a bad case of wanderlust and I count that a blessing. In the last decade I’ve spent time in a handful of different cities, states and countries. I’ve traveled abroad, learned another language, met celebrities, worked in the corporate world, fell in love and married a man with an accent. To my teenage ears that would have sounded like a dream. In many ways it has been my dream fulfilled. I wrote my dad a letter once as a teenager and in it I said, “no matter where life takes me Rock Hills Ranch will always be my home.” At the time I didn’t realize what a rare thing it is for a person to always have a childhood home to go back to. My children get to walk the same dirt paths I walked to the chicken house to pick eggs, skin their knees on the gravel roads I played on, catch bugs and pick wildflowers on the same hillsides I did the same, and swing in the tree swing that was put up when I was a child. We don’t get to relive our childhood but I have the unique pleasure of seeing my childhood through adult eyes with my children. This summer we had the fortunate opportunity to spend a month back at the ranch with our whole family. I noticed myself teaching my offspring many of the same life lessons in similar ways my parents taught me. Ranch life affords a unique setting for education. 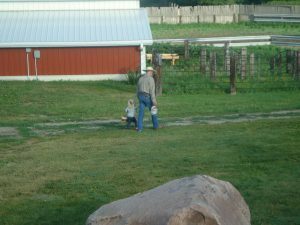 We had in-depth discussions on life cycles when we had to remove a dead chicken from the coop, an easy and natural conversation about gender identity when my eldest wanted to know the difference between the male and female donkeys, and a couple of conversations about how we care for and protect our family and those we love as we watched baby birds being pushed out of their nest, a doe protecting her fawn and a mother cat teaching her kittens to hunt. They both squealed with delight as they dug for potatoes, my daughter gorged herself eating peas straight from the garden and they learned both biology and fine motor skills picking eggs every day. They understand where food comes from, and starting to value our connection as caretakers of both plants and animals. Diversity is everywhere at Rock Hills Ranch. In nature, all living organisms have value and importance and must be present in order for the ecosystem to work. What a neat thing to watch my children grasp. A lot of the world’s most pressing problems could be solved if we as humans embraced that truth within our own race. Hard work, practical thinking, problem solving, manual labor, opportunities to practice patience and the need for teamwork are all principles available in abundance at RHR. There are so many more I could name but the bottom line is, I’m pretty confident in saying rural life provides hands on opportunities to learn all of life’s most important lessons. The most overwhelming experience on the prairie is witnessing the fingerprints of our Creator. The beauty of the prairie grasses shimmering and moving like ocean waves in the wind, the delicate wildflowers staying intact despite the elements, the fiery oranges and soft pastels of the sunsets and the intricate bird songs all dug deep into our souls, deepening our appreciation for and recognition of an artistic and loving God. We had ample time at the ranch to talk about family values and what we want our children to remember and stick with them as they grow to be leaders, truth-seekers and caretakers of the next generation. We got bit by the country bug and are itching to keep living life off the fast track, more intentional and in touch with our natural world. We are back to our normal life in suburbia but we hope our new normal will include more dirt on our hands, sharper eyes and ears toward nature and a slower cadence to life. My dreams for the future look a little different than those of my teen years. They have a striking resemblance to what I couldn’t wait to get away from 20 years ago — only with the addition of that handsome accented husband and some precious children in the picture. I may live 1200 miles from Rock Hills Ranch, but in my heart, it will always be home. In the past couple of weeks I have had the wonderful opportunity of attending a couple of workshops. The first one I attended was a range camp held near Fort Meade South Dakota. The camp is a workshop set up for the purpose of training Ag leaders in range and natural resource management. 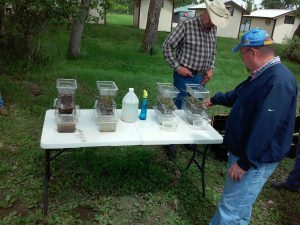 They covered topics such as range plant ID, soil health, production potential, stocking rates, range monitoring, USDA web soil survey training, and tours of local ranches and their practices. 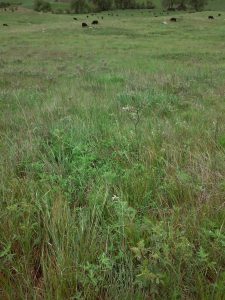 In this picture you can see a very great example of plant diversity in a pasture. When Lyle and Garnet first bought the place in the 1980’s There was very little of this lead plant you can see in the picture as a woody forb. But over the years by using a rotational grazing system it has become a lot more prevalent. Having a diverse plant community also helps with the health of the soil by the each individual plant can fixate different nutrients into the soil. I came away from this experience getting into the mindset of being able to think of all of the factors that go into an operation. Looking at soil health (what types of soil you have), having a diverse plant community, controlling weeds with grazing, looking at your pastures and grazing them in range and natural resource management and stewardship of natural resources. These were just some of the things that were covered during the camp. I ‘ve wondered as a young rancher what would be the best and most efficient way of getting into owning my own ranch. After asking around and listening to a lot of different opinions I have come to the conclusion that it is best to start small. Owning a couple of cows and running with another rancher. That way you can get the snowball rolling instead of just jumping into owning a ranch. This picture is a quick snapshot of the Rain fall simulator. They gave the demonstration at the range camp. The results on how much water was run off and how much was retained in the soil from the tilled ground and the native range was night and day. Look up some demonstrations on the Youtube. The second workshop was a lecture by Gerald Fry. He is a bovine engineering specialist. I would encourage anyone to go check out his website. He primarily focuses on hormone function, correlated linear measurements, and indicators of butter fat content. It is very interesting to now drive around on the ranch and look for these indicators of hormonal expression and indicators of a good cow. He emphasized line breeding and keeping a good line of genetics in your herd. Not to over cross your cattle. He was a pleasure to sit down with and pick his brain. to read and pick through. There is always something new to learn and ways of improving. I would invite everyone to be keeping your eyes open for workshops and camps throughout the summer no matter where you are in the world. It is always a great idea to get off of your operation and your own mindset and either learn something new or look at problems you are having from a different point of view. Till next post “Watch your topknot “Readers.